Thank you! A member of our team will be with you momentarily. If you require immediate assistance please call Marco at 416-806-6133. Thank you. Thank you! A member of our team will be with you momentarily. For quicker service please call Marco at 416-806-6133. Thank you. Living Shangri-La is elegantly situated on prestigious University Ave, Toronto's ceremonial grand boulevard. Surrounded by Adelaide and Simcoe streets, the property is just steps away from the city's finest entertainment, cultural, shopping, business, education, and dining venues. Westbank and Peterson group with James KM Cheng Architects are arguably Canada's foremost luxury residential developers and designers. 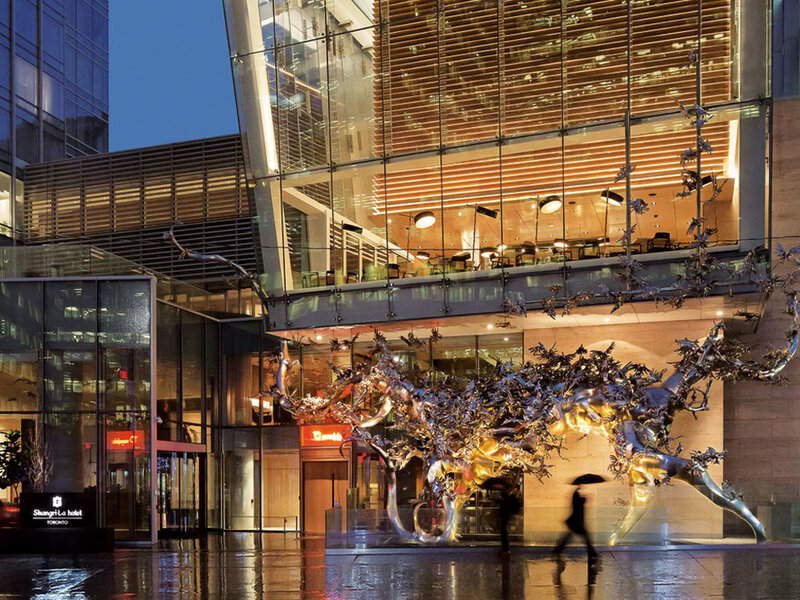 For Living Shangri-La Toronto, their collective vision has been integrated into an elegant and timeless 66 storey "Vancouver-style" glass tower. The uncompromising design program features the exclusive 200 room Shangri-La Hotel (floors 1-17) with 20,000 sq ft of amenity space that includes an indoor pool, health club, spa, 2 restaurants, lounge, business centre, private theatre, banquette rooms all accessible to the residents and one of Canada's largest public art commissions. Atop, the residences (floors 18-49) and Private Estates (floors 50-66) offer superior views and lifestyle above Toronto. The 704-foot glass tower is a timeless, elegant form, respectful of its privileged setting on University Avenue, Toronto's grand boulevard. The tapered appearance of the tower responds to its landmark site on the curve of the avenue, opening to spectacular city and lake views. Transparency is achieved by the streamlined glazing along with a series of light-filled glass pavilions at the podium to address the street in an invitational manner. Landscaped indoor-outdoor amenities on the ground floor and via elevated terraces further animate the base of the property. A unique folded faceting feature on the University Ave elevation provides additional architectural interest, reminiscent of a prism, enlivening both daytime and nighttime experiences of the building. Suites include Italian-style kitchens, high-end Sub- Zero and Miele appliances and marble and stone finishes. Amenities Residents will be able to take advantage of the in-house spa, a fitness centre and such a la carte services as housekeeping and room service. There will be a concierge and doorman, and residents in the estate and penthouse suites will also have valet parking included. The hotel will feature restaurants and retail elements, the Four Seasons Centre for the Performing Arts is across the street, shopping and the services of downtown are close by. Toronto's striking cityscape unfolds before you, a feast for your eyes. You recline in a plush sofa in your spacious suite at Shangri-La Hotel, Toronto. From this vantage point, you gaze upon the gleaming city that is Canada's largest metropolis. The day begins in the hotel's Health Club. You notice the pool engulfed in natural light, with cascading water features and contemporary chandeliers above, enhancing the ethereal experience. You decide to discover Toronto, setting off from the hotel's central location in the heart of the city. The Concierge desk offers the option of hotel cars, ready to take you to luxury boutiques within mere minutes. North of the prestigious University Avenue is the Art Gallery of Ontario. Westward lies the city's theatre district. To the south is a vibrant waterfront area dotted with boutiques and cafés. In the opposite direction, Yonge Street, Toronto's noted thoroughfare is brimming with life. Your options are almost unending and you can't wait to begin. Before you know it, the afternoon sky soon gives way to the deep hues of sunset. You head back to the hotel with an appetite and stop in the hotel's Lobby Lounge for Afternoon Tea or dim sum. The day has been enchanting and you retire to the plush comforts of your room. Beyond floor-to-ceiling windows, the dazzling city winds down as you slip between luxuriously soft sheets. This is bliss, right here, at Shangri-La Hotel, Toronto. Stylish Urban dining at BOSK: Bosk, the signature restaurant at Shangri-La Hotel, Toronto, brings to life ingredients harvested a la minute from a network of respected global suppliers. Diners can expect Asian inspired, distinctly Canadian modern cuisine made with seasonal regional ingredients and served with genuine, caring service. Relish the finest wines and spirits at THE BAR: Head to The Bar for an intimate setting, complemented by a carefully chosen beverage list that celebrates classic cocktails from the 1930s. 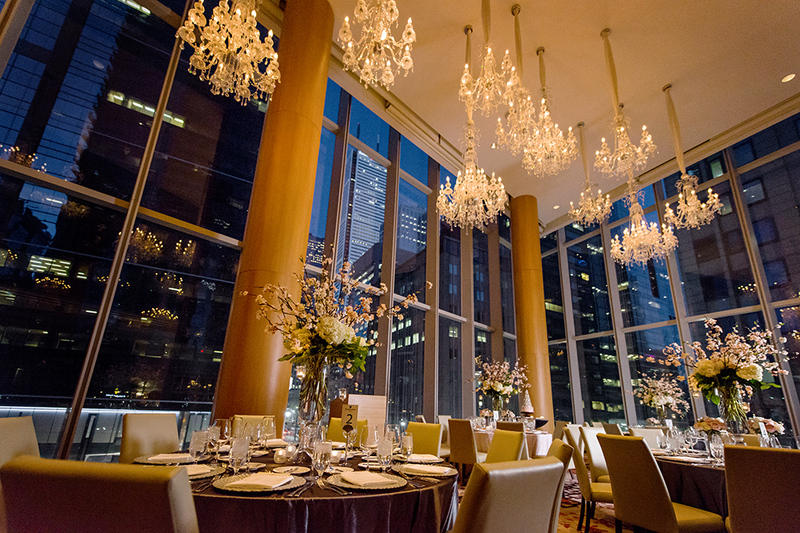 Are you looking to purchase or sell a suite at the Shangri-La Residences Toronto? It would be our pleasure to assist you.